The concrete jungle hides a million dreams... and a million ways to die. The world of The Edge of Midnight is defined by her cities. Skyscrapers tower over blood-stained cement, as criminal syndicates pull the strings in the halls of power. Warlocks and private dicks rub shoulders with gaunt gangsters and femme fatales, each of them searching for that one lucky break to put them on top. There are fortunes to be made here, but the price is steep. Desperation and ambition walk hand-in-hand, and one wrong step could punch your ticket for good. 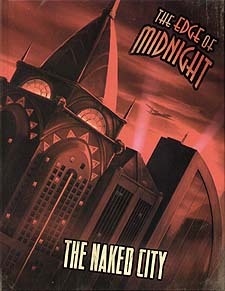 Five of the most impirtant - and dangerous - cities in The Edge of Midnight universe are covered in this collection. From the sun-drenched beaches of Paradiso to the dark alley of New Eden, from the halls of power in Nova Roma to the gangsters' hideouts of Central City, no stone is left unturned. Each city has complete details on playing and running stories within them, including maps, locations, NPCs, and scenario hooks. Take a walk through the naked City.... it may be the last thing you ever do.